Only 5 minutes away lies the charming village of Port Grimaud, "Venice" of the Cote d' Azur. The port is full of waterways and canals, which are great shopping oppurtunities and lovely restaurants and cafés can be found. A typical provençal market takes place here twice a week. 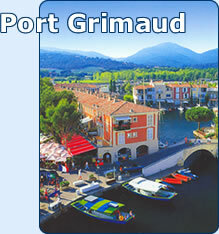 Port Grimaud possesses an example of gentle holiday architecture which fits the country and is proud of its originality. It was founded in 1964. The houses are built with Mediterranean architecture and normally are not higher than 3 floors.